1 of 3 Heat 1 tablespoon of the oil in a large nonstick skillet over medium-high heat. Add beef to skillet and cook, stirring occasionally, for 8 minutes, draining any accumulated fat. 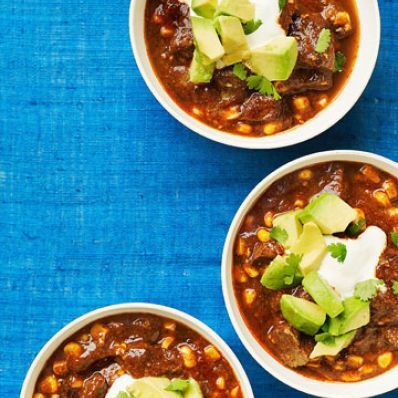 Remove beef to slow cooker; reduce heat to medium. Add 1 teaspoon oil to skillet; add garlic and onion and cook, stirring, for 2 minutes. Stir in 3 tablespoons chili powder, 2 teaspoons cumin, 1/2 teaspoon salt and 1/4 teaspoon cayenne; cook 1 minute, stirring constantly. 2 of 3 Scrape skillet contents into slow cooker and add corn and 3-3/4 cups water (enough to cover by 1 inch). Cover and cook on HIGH for 4 hours or on LOW for 6 hours. 3 of 3 When there is 1 hour cook time remaining, stir together corn meal and 3 tablespoons water. Stir in cornmeal paste, remaining 1 teaspoon chili powder, 1-1/2 teaspoons cumin, 1/2 teaspoon salt and 1/4 teaspoon cayenne; cook for 1 more hour or until thickened. Garnish with sour cream, avocado and cilantro, if desired.